For years I have shunned gold jewelry, stating that it was for 'older people'. I suppose I have now become one of them, because I want nothing more than to adorn myself in classy, delicate gold pieces. At my local bead store I found these tiny gold balls with cubic zirconia embedded in them, and I made these cute earrings. 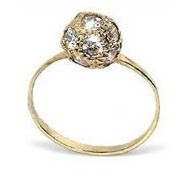 Now I've found this matching ring on Amazon, half off for $46. I love the thin, 2mm band and the fact that it's solid gold. I'd love to have several of these oversized bangles on my wrist, perhaps at all times - for causal looks, evenings out, the kind of classy look that would make a black tee and jeans into an outfit. 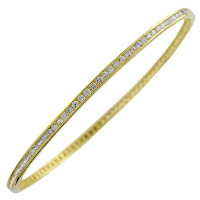 14k Gold plated silver bangle with cubic zirconia, $30 at Amazon. 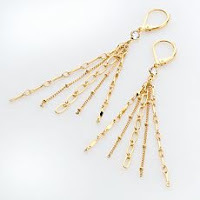 For pieces which are merely gold tone, I like these Chain drop earrings by Daisy Fuentes at Khols, for $9.10. I can imagine wearing these with my hair down, letting only little glimpses of gold shine through when I fuss with my hair. 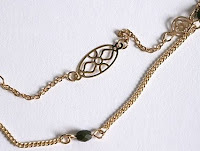 I love the length of this Jewel Box Necklace by Urban Outfitters for 12.99. At 34" it will fall well below the neckline and will look lovely when combine with a scarf wrapped around the neck. The double strand necklace has little filigree beads and small dark faceted beads, to add plenty of personality to the gold chains. Bringing in the New Year with new clothes!